Party World, also referred to as Mario Party World, is a floating theme park that hosts a variety of minigames and Gaddgets, unique objects created by Professor Elvin Gadd, as well as several unique lands hosted by Tumble, Toad, Toadette, and Professor E. Gadd. Before entering the area, a passport must be created, which features some basic information as filled in by the player, including their name, birth month, hobby, basic face, biggest dream, and biggest secret. In Mario Party Advance, the player is invited here to enjoy themselves, but as Toad is introducing them to the area, Party World gets attacked by Bowser and Koopa Kid. The two of them throw every minigame and Gaddget to the ground, towards Shroom City. Toad instructs the player to go after Bowser and collect everything that they knocked away in order to enjoy the games themselves. In-game, Party World serves as the hub world, presenting the player with a menu that leads them to Shroom City (where the bulk of the gameplay takes place), which is hosted by Tumble, or one of the three "Lands" where the collected minigames and Gaddgets can be played: Play Land, Party Land, and Challenge Land. Each Land offers a different take on the gameplay. Play Land is hosted by Toad and Professor Elvin Gadd, featuring the most basic incarnation of the gameplay. Each of the minigames and Gaddgets can be accessed here without any gimmicks. By using a Game Link Cable, a player who owns Mario Party Advance can connect to someone who does not own the game and let them temporarily play a single minigame or Gaddget on their own. A multiplayer game called Penguin Race can also be accessed here, which involves two to four players racing Penguins by comparing their records in minigames (with the player with the best records winning). Party Land is hosted by Toad and Toadette, and focuses on playing minigames between players. One mode involves using a Link Cable and a single GamePak to play a Duel minigame against someone, and another requires using two Link Cables and two GamePaks to either compete for the best score in a set of Koopa Kid minigames or for the best score in random minigames in order to view the other player's secret. The other two modes allow up to 100 players to compete: in the 100-player Battle, one player sets a record, and if the succeeding two players fail to beat the record, the first player wins, though if one of them sets a better record, the two succeeding players are then required to beat their record, repeating the cycle until two players fail; in the 100-player Attack, one player sets a record in a minigame, and up to 100 other people can attempt to beat it, with the Attack ending either when one player succeeds or the limit is reached (at which point Toadette shows her "treasure" to the player, the Toad Force V Gaddget). 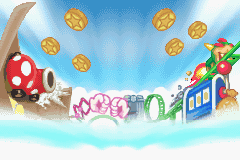 Challenge Land is mainly hosted by Toadette, and features modes dedicated to collecting coins. Mini-game Attack involves playing a gauntlet of minigames that are more difficult than usual, with a grand prize of 100,000 coins, Game Room involves playing the gambling minigames unlocked through regular gameplay, with all of the rewards for successful gambling still achievable, Duel Dash involves a gauntlet of duel minigames against a computer player, with a grand prize of 50,000 coins, and Bowser Land (hosted by Bowser and Koopa Kid) involves playing a string of Bowser minigames while trying to reach the end, with Bowser rewarding the player depending on how fast or how slow they were in reaching him. Challenge Land also features a shop, run by E. Gadd, where various Gaddgets can be bought, including the Posters, the Bonus Track, the Passport+, the Credits, and the Power Star. ↑ Mario Party Advance instruction booklet, page 7. This page was last edited on February 5, 2019, at 17:31.